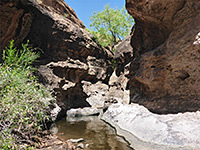 There are many ravines in the Superstition Mountains east of Phoenix, a few explorable by official trails like Boulder Canyon, and others by off-trail hiking such as Fish Creek, but many are rather inaccessible, because they are far from a road and/or blocked by dryfalls and other obstructions. 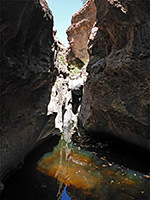 Some contain permanent streams though most have only seasonal water; also, the majority are relatively wide, as the predominantly volcanic rocks of the Superstitions are not conducive to the formation of slot canyons, so the narrow passages that do occur tend to be quite short and not so deep. 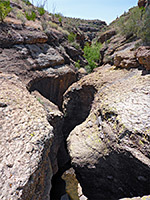 The easiest accessed of such narrow ravines is on the south side of the Apache Trail three miles east of Tortilla Flat, where an unnamed south-side tributary of Mesquite Creek forms a canyon which is enclosed for about one mile and has a proper slot for 600 feet - only at most 30 feet deep, but enclosed enough to make exploration quite challenging, since it contains several near-permanent pools, up to six feet deep, and two dryfalls. The passageways are pretty, with a few slender cottonwood trees in the lower end, and layered slopes above, home to cacti and yucca. The slot section can be explored in less than an hour, while up to two hours are needed if continuing downstream along the deeper, wider lower gorge. A suitable parking place is along the Apache Trail 3.1 miles east of Tortilla Flat, beside an electricity pylon and concrete building - near the end of the paved part of the trail, just south of some powerlines. 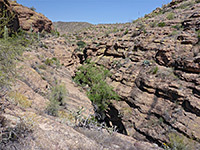 This section of the route runs along a narrow ridge, with canyons on both sides; the slot is to the south, out-of-sight of the road. 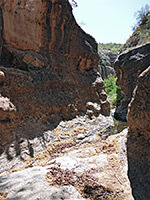 Ravines hereabouts tend to descend in several steps, a series of low cliffs and narrow benches, all formed of light brown, layered, igneous rocks (ash-flow tuff). 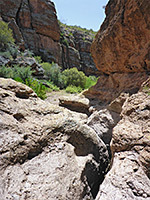 It is relatively easy to climb down to the streambed of Apache Trail Canyon, and follow it downstream a short distance to the 20 foot drop-off at the start of the slot, framed by jagged-textured rocks. There does not seem to be an easy climb down route here, or any intermediate entry points, so unless equipped with ropes for rappelling, the slot is best accessed from below, either by climbing over a ridge to the southeast, descending into another fork of the drainage and walking downstream to the confluence (just below the slot), or by following the slot on the northwest side, then scrambling down the cliffs; the canyon is not very well known but visited often enough to have a cairned-route down to the streambed, more noticeable from below than above. This leads to a point just below the confluence. 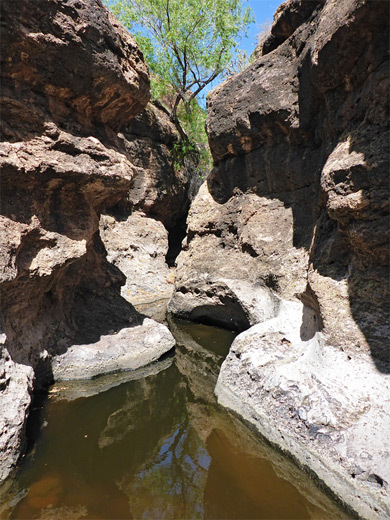 The lower end of the slot has some twisty passages leading to a pool and a brief wider section followed by a deeper pool below a chokestone. 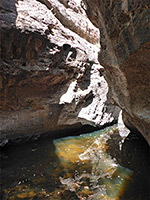 The water is cold, dark, stagnant and often rather deep, so the chokestone is the end of the easily entered part; above are more shallow passageways before the dryfall at the start of the slot. 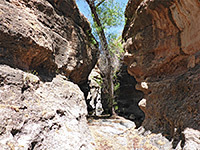 Below the slot, the gorge becomes up to 200 feet deep, rather overgrown, and contains many boulders - some big enough to create short, dark, cave-like passages along the valley floor, but it is not too difficult to walk another 0.7 miles, where the gorge opens out, and a further half mile until the sloping sides to the north allow climbing up to the plateau and back to the road (partly along a disused track), from where the parking place is 0.4 miles away, uphill.